Well, I’m on my way back to Ottawa after a crazy flurry of family-time back on the east coast. As always, the company was great and the food was fantastic. I must admit, though, it gave me a weird feeling to watch the ground fall away from beneath this 737, seat 21F. Nova Scotia drifted away as it always has, but somehow it felt different this time. 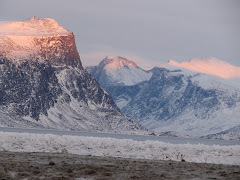 Pangnirtung is definitely closer than a lot of the places I’ve ventured off to, but it seems bigger – greater – somehow. I’m not really sure how to explain it. I decided against giving the dogs any gravol for the flight back…they’ll be getting it on their next journey. Poor Gryphon is here beside me crying like someone in pain. I won’t say a baby because a baby is more apt to give out a wail; this is just a constant, high-pitched moan. Like I said: painful. Things are coming together for the move. Although I have a lot to do, it’s all organized into discrete time units. I should be able to swing it if I just keep moving. Keep moving. It’ll start when the plane lands and end about an hour before I have to board on Monday morning. I think the flight north will involve a little shut-eye. Maybe. Hmmm…which will win: the accumulation of far too many skipped sleeping hours or the anticipation of a new adventure? I’ll keep you updated.